As you master the following order of exercises, you will be able to relieve pain and protect your back. I found even the first 10-12 exercises in this program were a great help in relieving pain and spasm in muscles of the lower back, and helping to wake to a more mobile back in the morning. If you have disc problems diagnosed by MRI and have had serious pain episodes from doing ‘stuff you used to do with no problem’, start slowly and don’t overdo it. Before you begin the first exercise, start here. It will help you to develop the right mindset to be able to follow this very easy but challenging program. In Part 1, I explain why the cycle of back pain is so difficult to break, how to break it, stay focused & committed, and the ways to avoid the pitfalls that lead us to give up too easily. I believe that this chapter is a vital prerequisite to following the back pain exercises. It is not only about performing the exercises, but patiently committing to them as you progress. There are many exercises here to master. Why? Because solving back pain is NOT a quick fix. Many imbalances occur before it begins to really hurt. Fortunately, there are exercises for each one. 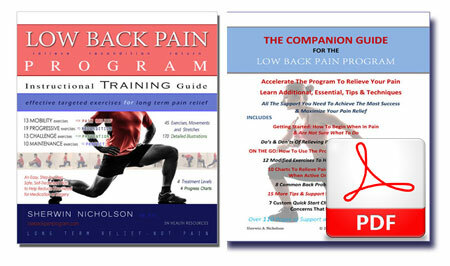 I break them up into 4 key stages, from easy to challenging, targeting every area that affects your back. Here you will find exercises that you are familiar with, combined with ones you have never thought would help back pain but are essential. As you progress and master the exercises, you will not need to perform them again unless you desire. It is not easy to begin when you are in pain and have difficulty moving. These are the exercises for you to begin with. They will carefully help to free your stiffness and spasms. Nothing risky or intimidating here. After you have become more flexible and have experienced less pain, you can begin to strengthen your weaknesses and imbalances. Here you will develop more stability and flexibility for your back. By improving your hip flexibility and leg power, your back injury will recover sooner. These exercises are for prevention. You will better prepared in keeping your back issues from returning now. Here, you will be able to develop the flexibility and power that your back needs when your are very active. Once you have mastered these exercises, you will now only need to perform the 10 most important ones (written in the eBook). They will be your core set to help maintain your back. You don’t need to do the others anymore unless you prefer. At this point in the program, you can easily do these ten quickly in under 15 minutes, anytime. A list only of more exercises that also benefit back pain. You may already know most of them but they are not illustrated here. You can add them to help complement the program for your own desire but they are not required. Keep track of your progress with these charts. There are quite a few to do. Do as many or as few as your body can support. Never rush them though. Are you Frustrated with Searching Online for Help? Need Clear Guidance and a Structured Plan? The Sample Exercise will help, but you will need the full benefit of all of the exercises for long term relief. Order Your Copy Now and Begin Treatment Here! Learn why it can help you and how it helps your pain. Format: Kindle Edition Verified Purchase Excellent…really provided me with back relief even though I’m only currently on stage 1 of the programme. The exercises can be down around the house and at any time during the day which is great if you can only fit 10 minutes here and there.